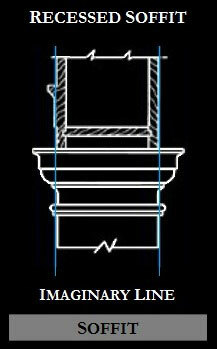 Columns are designated by us as either 100, 200, 300, or 400 according to designs and prices. 100 which is the most expensive to 400 which is the most economical. fiberglass composite columns and our Colossal columns. primed columns should be painted with two coats of oil-based paint. PolyStone® columns may be stored. The orders can be placed on top of one another to achieve a greater height than a single story. tapering to 8" at the top diameter. column. When the projection exceeds half the width of the column, it is an engaged column." shadowing. This would not be effective when using pillars. decorative use. Wooden columns should not be used to surround water pipes. be an imaginary vertical line from the smallest diameter to the overhang.